"This Southern Hemisphere event is visible from a D-shaped region in the Antarctic Ocean south of Africa," said eclipse expert Fred Espenak, of NASA's Goddard Space Flight Center, on the space agency's Eclipse Web Site. "Such a remote and isolated path means that it may very well turn out to be the solar eclipse that nobody sees." However, the timing of the solar eclipse lends it some unusual characteristics, making it notable to astronomers. The European Space Agency hopes to use its Proba-2 satellite to observe the event. First, the July 1 partial solar eclipse is the third of a series of sun and moon eclipses within a single month. Several conditions have to line up for an eclipse to take place. The moon must be in its full or new phases, for example, when it reaches a point in its orbit that intersects with the plane of Earth's orbit, which is called a node, Rao explained earlier this week. When the moon is near these node points, it can create a solar eclipse (when the moon is between the sun and Earth) or a lunar eclipse (when Earth is between the moon and the sun). The total lunar eclipse during the full moon on June 15 was extremely closely aligned with its respective node point, which meant that the new moon phases on either side would be in position for a partial solar eclipse, Rao explained. "Such an unusual circumstance as this won't happen again until 2029," Rao wrote. 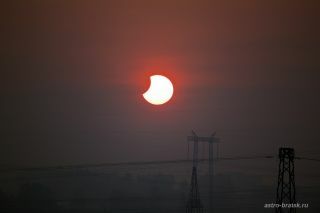 The other notable feature of Friday's partial solar eclipse is that it kicks off a completely new series of eclipses in what is known as the Saros cycle, astronomers said. Astronomers have long used the Saros cycle to organize eclipse events because of their predictability. The cycle is 6,585.3 days long (that's 18 years, 11 days, 8 hours) and marks the time between two eclipses with similar geometry in the night sky. While each Saros cycle lasts just over 18 years, one series of these cycles can last centuries. According to Espenak, each Saros series can last between 1,200 and 1,300 years. So while Friday's partial solar eclipse will be a less than impressive sight to behold, on the cosmic scale, it is a major turn of the clock. "This event is the first eclipse of Saros 156," Espenak explained. "The family will produce 8 partial eclipses, followed by 52 annular eclipses and ending with 9 more partials" between 2011 and the year 3237.